Typically, contact lenses help people see clearly, but leave it to Google to go “outside the box” with its own contacts, which have medical benefits that go way beyond mere vision. In fact, Google’s lenses don’t help you see at all. Rather, they monitor your blood sugar (AKA glucose) levels. If that doesn’t sound useful to you, then you’re probably not one of the 382 million people worldwide who are diabetic. People with diabetes tend to check their blood sugar levels multiple times a day (up to 10, depending on the type of diabetes) to avoid medical problems like hypoglycemia (low blood sugar) or, in severe cases, a diabetic coma and damage to the heart, kidneys, eyes and limbs. In the US, diabetes is the seventh leading cause of death and is the leading cause of kidney failure, non-traumatic lower limb amputations and new cases of blindness. The standard method of checking glucose levels involves pricking a finger to draw a drop of blood that a blood glucose meter can analyze, but Google’s contacts allow diabetics to avoid that hassle by continuously monitoring blood sugar levels as long as they’re on the person’s eyes. 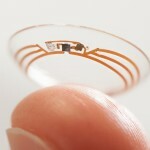 The smart lenses work by utilizing a tiny sensor (so small it looks glitter) embedded within the soft lens material. When the sensor comes into contact with tear fluid seeping through a small pinhole in the lens, it measures blood sugar levels — one measurement every second. Google is even exploring the possibility of incorporating tiny LED lights into the lenses to alert users when glucose levels are at a dangerous level. There are currently continuous glucose monitoring (CGM) systems on the market — typically sensors inserted under the skin that check glucose levels in tissue fluid — but because they’re not as accurate as standard blood glucose meters, diabetics still need to prick their fingers to confirm glucose levels with a meter. The hope is that Google’s lens will be accurate enough to avoid this step. The smart lens is years away from becoming an everyday usable tool, however. It’s still in the prototype phase and is undergoing testing while Google engages in talks with the Food and Drug Administration (FDA) to help make sure the final product is safe and accurate.